Captain Michael has called Hilton Head Island home since his move from Paris, TN in 1996. He has been fished professionally locally and abroad for over 22 years. Fishing has been a long time passion. He knew that he would follow in his family’s footsteps and began guiding charters for a living from a young age. His father, Jim Perry, is a well-respected fishing guide on Kentucky Lake in NW TN, where he grew up fishing every day after school on the floating docks of Buchanan Resort. Michael’s first job as a mate in Hilton Head was on the Fishn’ Mission captained by local Charles Getszinger out of Outdoor Resorts. Charles’s local fishing knowledge of Port Royal Sound was handed down that year as Michael began to learn the ropes the hard way; working the deck of a charter boat in one of the finest fisheries on the SC Coast. His next ride was on the Echo captained by Randy Osterstock out of Harbor Town Yacht Basin. Being in this marina for almost 10 years is what exposed him to some of the best professionals in the field. 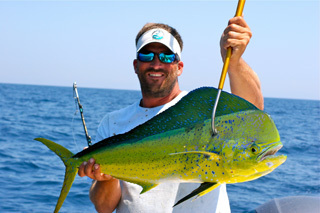 Offshore fishing quickly became his passion and he began to receive the learning experience of a life time. Many of these boats traveled abroad for a portion of the year, and every trip away from home provided him with knowledge that could only be learned first-hand. Some of these places included the Outer Banks in NC, South FL, FL Keys, Bahamas, Dominican Republic and Costa Rica. Whether you're a local to South Carolina, or just visiting us, Michael and his crew want to set sail with you. 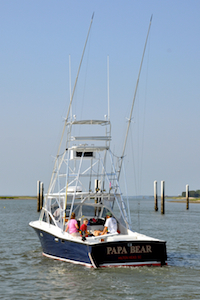 Papa Bear Charters will provide you with one of the highest quality fishing experiences available. Not only are these waters abundant, but Papa Bear has the experience to guarantee you a great time. No matter the season, we will work hard for every client and do our very best to produce world class results for every charter. If you'd like to take a trip with us, or if you just have any questions, please feel free to come in or Contact Us today.